Preheat over to 400 degrees. Butter 6 individual over proof baking cups. Place one apple in each cup. Mix together chopped walnuts, chopped raisins, brown sugar, cinnamon, nutmeg, 2 Tsp melted butter and cream. Divide mixture evenly in the apples, pressing some well into the core and heaping the rest one top of each apple. 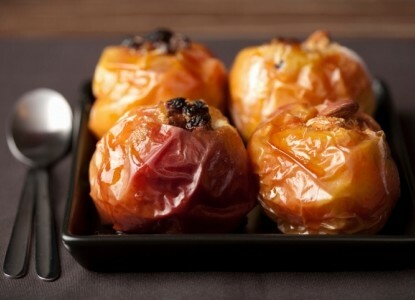 Pour 1 Tablespoon melted butter and 2 Tablespoons maple syrup over each filled apple. Bake for 35-40 mins until apples are tender but still hold there shape. Let cool to warm serve with a dollop of soft whipped cream and a dribble of cold maple syrup on each.